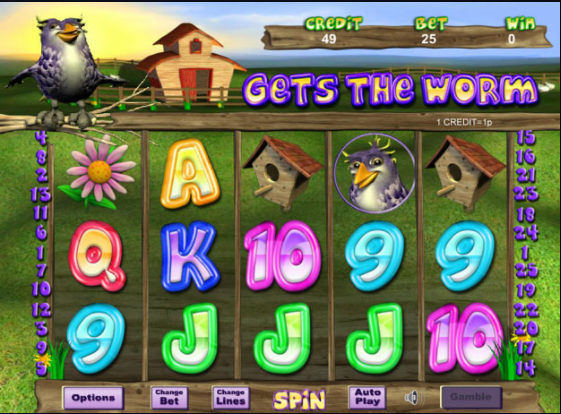 It’s no secret that the early bird always catches the worm, so get in there before the rest and explore the skies for grubs in this 5 reel, 25 payline video-based play slot online game. Eyecon is now stalwarts of the online gaming work after providing over a decade of constantly innovative online slot games that work perfectly across mobile devices and widescreen computer devices. Eyecon is renowned for their approachable graphics and interactive game boards, so click here to find out more about UK slot games created by Eyecon today. Get the worm operates in a standard 5 reel format with 3 reels and 25 paylines that can be matched. This game focusses on one young bird's mission to uncover the most prized commodity to him: worms. Enjoy an upbeat farmyard feel to this game which creates a friendly and affable environment to spin the reels and win yourself some cash. In addition, you can enjoy the country jingle soundtrack but this can be toggled on or off if you are simply looking for some slot playing peace and quiet. This game puts its gameplay in a level equal to the UKs best slot games to play! For anyone not looking to put any money into this game then you may want to sample the free mode that this game has on offer. Alternatively, bets can be placed for as small as 1 penny with a maximum jackpot that in some circumstances can be multiplied up to 20,000 times you’re original stake. For this reason alone, get the worm is definitely an online slot game worth pursuing. In terms of the game’s look and feel, Get the worm’s basic premise is that a cartoon bird is desperate to acquire as many worms as possible by chasing them around a field that doubles up as an online slot game board. Get the worm is a very enjoyable enterprise and it’s fun to watch the wheels spin from symbol to symbol. The smaller, less impressive symbols are represented by letters, which is a fairly run of the mill concept for online slots these days. Alternatively, the symbols that you want to be landing on are the birdhouse, the bird himself, a watering can, and a big happy worm who is about to realise his fate. Most gamers become attached to their slot of choice because of the game and the bonus features that it has on offer. Explore the range of wild and scatter symbols that help give this game an extra twist. The Wild symbol is a play on the game’s logo and acts as the king-pin symbol that trumps any other symbol on the game. This symbol can be used to combine and multiple winning combinations. The scatter symbol is obviously the smiling worm as it wriggles around your screen. Find the worm and two of his friends and you will be granted some much needed free spins. In addition, you can gamble your winnings which is always a favourite feature of gamers everywhere. 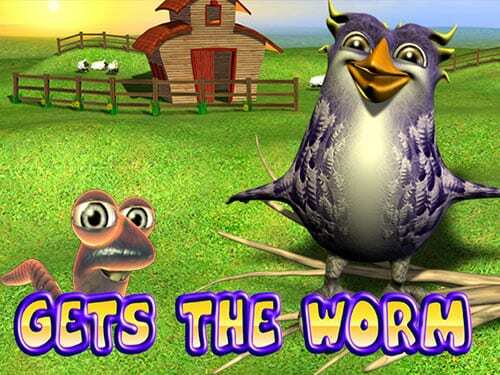 Get the Worm is a touching farmyard adventure about the exploits of a small bird and his quest to discover some worms. Eyecon has created a very friendly and user-friendly game that can be enjoyed by a whole range of players. This online slot has the power of bonus features on its side and this is something that definitely separates itself from the rest.